alaTest ha raccolto ed analizzato 66 recensioni su Pantech Crux. La media della valutazione per questo prodotto è 2.8/5, confrontata con la media della valutazione di 4.3/5 per altri Cellulari. Gli utenti sono impressionati da fotocamera e portabilità. In aggiunta, durata batteria e schermo sono inoltre apprezzati ma si osservano varie lamentele circa la performance. Abbiamo analizzato differenti valutazioni di esperti ed utenti, età del prodotto ed altri elementi. A confronto con altri Cellulari, Pantech Crux ha ottenuto un alaScore™ complessivo di 81/100 = qualità Molto buono. The Pantech Crux offers a lot of features and a distinctive design, but the touch screen UI needs work. Sleek appearance. Solid video playback. Great battery life. Finicky touch screen and lock mechanism. Sluggish. Poor stereo Bluetooth performance. The Pantech Crux has sluggish performance, and the touch screen can be rather finicky. Call quality is mixed. The Pantech Crux makes a good multimedia feature phone on paper, but its poor touch-screen performance prevents us from recommending it. 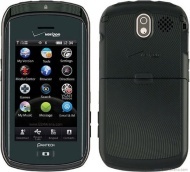 Verizon has only just released the Pantech Crux and it is being scooped up by tech savvy individuals everywhere. Find out more about what this phone has to offer. Love listening to music on the go? Don't want a smartphone? Verizon and Pantech have heard your cries for help and have produced just the phone for you - the Pantech Crux. "You'll flee, how this made it, I'm not even sure"
The screen is big when it's not white! "It's the worst phone I've ever had." The alarm system never work. "Worst phone I've ever had." I've had this phone for close to 2 years. It's absolutely awful. Don't even consider it, you will be disappointed.